Currently the Mississippi delta stands as a highly degraded and threatened coastal ecosystem having lost about 25% of coastal wetlands during the twentieth century. To address this problem, a $50 billion, 50 year restoration program is underway. A central component of this program is reintroduction of river water back into the deltaic plain to mimic natural functioning of the delta. However, opposition to diversions has developed based on a number of perceived threats. These include over-freshening of coastal estuaries, displacement of fisheries, perceived water quality problems, and assertions that nutrients in river water leads to wetland deterioration. In addition, growing climate impacts and increasing scarcity and cost of energy will make coastal restoration more challenging and limit restoration options. We address these issues in the context of an analysis of natural and artificial diversions, crevasse splays, and small sub-delta lobes. We suggest that episodic large diversions and crevasses (>5000 m3 s−1) can build land quickly while having transient impacts on the estuarine system. Small diversions (<200 m3 s−1) that are more or less continuously operated build land slowly and can lead to over-freshening and water level stress. 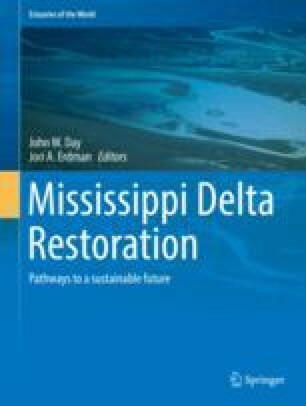 We use land building rates for different sized diversions and impacts of large periodic inputs of river water to coastal systems in the Mississippi delta to conclude that high discharge diversions operated episodically will lead to rapid coastal restoration and alleviate concerns about diversions. Single diversion events have deposited sediments up to 40 cm in depth over areas up to 130–180 km2. This approach should have broad applicability to deltas globally. Partial support for this project was provided by a grant from the Gulf Research Program of the National Academies of Sciences, Engineering, and Medicine. Additional support came from the Coastal Sustainability Studio and the Department of Oceanography and Coastal Sciences at Louisiana State University (LSU). We thank Hampton Peele of LSU for satellite imagery of the Davis Crevasse and Don Davis for information on historical crevasses. This chapter is a reprint of Day et al. 2016 (cited below), originally published in Estuarine Coastal and Shelf Science. Permission to reprint this was granted courtesy of elsevier. We provide an addendum at the end of this chapter. To reference the main text, cite the Estuarine Coastal and Shelf Science version. Cite this chapter to reference the materials from the addendum. Day, J.W., Lane, R.R., D’Elia, C.F., Wiegman, A.R., Rutherford, J.S., Shaffer, G.P., Brantley, C.G. and Kemp, G.P., (2016) Large infrequently operated river diversions for Mississippi delta restoration. Estuarine, Coastal and Shelf Science, 183, pp. 292–303. We present here modeling results for a large and intermittent river diversion into the Maurepas Swamp, a 57,000 ha baldcypress tupelogum (Taxodium distichum – Nyssa aquatica) shallow, forested freshwater wetland system in southeast Louisiana (Fig. A1, see Rutherford 2017). The Maurepas Swamp is currently suffering from subsidence, permanent flooding, lack of sediments and nutrients from the Mississippi River, nutria herbivory, and saltwater intrusion from increasing sea-level rise and drought (Shaffer et al. 2009, 2016). The Maurepas Swamp is located further upstream from large diversions in the Coastal Protection and Restoration Authority’s Coastal Master Plan, and will more efficiently build land due to shallower water and flat topography. To estimate land building, we used a 2-dimensional delta progradation model originally developed by Dr. Gary Parker (Parker et al. 1998; Parker and Sequeiros 2006; Kim et al. 2009). The delta progradation model assumes radially symmetric delta formation, a flat basin floor, and negligible hydrodynamic effects. In addition to sediment accretion from the river diversion, relative wetland elevation is affected by accelerating sea-level rise and wetland subsidence. The amount of mud retained in the delta and the fan spreading angle must be specified by the modeler. To approximate the mud retention in the swamp, we used data from the Day et al. (2016) study of the 1927 Caernarvon crevasse. Using sediment cores, Day et al. (2016) estimated that 55–75% of the total sediment was retained during the crevasse at Caernarvon. If 10% of the river discharge is diverted, and assuming that 30% of sand discharge and 100% of mud discharge is delivered by the crevasse into the basin, a total sediment retention of 55–75% corresponds to a mud retention of 44–69% (for details see Rutherford 2017). We assume that the fan spreading angle within the Maurepas Swamp will be 120°, matching the fan spreading angle of the Wax Lake delta. Sediment is transported to the swamp via an 18 km long, 177 m wide, and 20 m deep diversion channel, which we assume is 30% efficient at capturing sediment from the river. Rates of eustatic (global) sea level rise used in this study cover the full breadth of scientific projections. The “no-change” scenario (SLR-1) assumes a constant rate of sea-level rise equivalent to the current rate, which is about 3.5 mm/year (Nerem et al. 2010, http://sealevel.colorado.edu/). This is near the low end reported by IPCC process-based models; Church et al. (2013) report a minimum value of 0.31 m of sea-level rise by 2100, relative to 1992. The SLR-5 scenario is consistent with the uppermost sea-level rise reported by semi-empirical models and new findings which indicate greater contributions from polar ice sheets. These studies suggest up to 2 m of sea-level rise (relative to 1992) by 2100 (Pfeffer et al. 2008; Vermeer and Rahmstorf 2009; Parris et al. 2012; Deconto and Pollard 2016). For this study (in addition to SLR-1), we developed four scenarios (SLR-2, SLR-3, SLR-4, and SLR-5); each begins with 3.5 mm/year of sea-level rise in 2016, and accelerates according to a second order exponential function towards a specified sea-level in 2100 relative to 2016 (0.57 m, 1.03 m, 1.45 m, and 1.83 m, respectively). Figure A2 presents potential land gain trajectories for a 7079 m3/s river diversion into the Maurepas Swamp, operated for 16 weeks every 2 years. Simulations for the large, intermittent diversion begin in 2030 based upon documentation from the 2017 Coastal Master Plan which estimates river diversion projects require up to 6 years of engineering and design and up to 7 years of construction (McMann et al. 2016). Land gain was simulated for 50 years, also to be consistent with the Coastal Master Plan. Land gain is rapid, as the Maurepas Swamp is shallow (the water depth is on average 26 cm in the depositional zone, and we assume an additional 10 cm of water from diversion discharge) and the topography is flat. Based on these results, impressive land building is possible with a large and intermittent river diversion. However, there is significant variation in land building with respect to sea-level rise trajectory. Compared to the total land gain over 50 years in the SLR-3 scenario (143 km2), the total land gain in the SLR-1 scenario is about 50% greater (214 km2) and the total land gain in the SLR-5 scenario is about 28% less (103 km2). The most striking result is that continued land gain past 50 years is possible in all sea-level rise scenarios but SLR-5. In the SLR-5 scenario, the sediment supplied is no longer able to fill the increasing accommodation space at 44 years. In each scenario, annual land gain decreases due to the increasing amount of sediment required to maintain land gain with greater delta size, and due to the increasing accommodation space with increasing sea level. Day et al. (2016 and reprinted here in this chapter) demonstrated that a large, intermittent river diversion has many advantages compared to a continuously operated river diversion. This example shows that although land building will still be affected by climate trajectories and future sea-level rise, continued land gain is still possible in all but the worst-case scenario (Table A1). Here we show the potential synergy between river diversions and marsh creation and how the cost of sustaining wetlands with marsh creation is affected by both sea level rise and energy price. As we discussed in chapter “ The Costs and Sustainability of Ongoing Efforts to Restore and Protect Louisiana’s Coast”, dredging is highly fuel intensive and it’s costs are sensitive to energy price. About 60-70% of a marsh creation project is typically spent on hydraulic dredging alone (Caffey et al. 2014, CPRA 2012a), and about 20–30% of dredging costs are spent directly on fuel depending on fuel price and project design (Belesimo 2000). The price of energy, crude oil in particular, also affects the price of dredging indirectly because energy is needed at every transformation in the economy and is strongly correlated with the price of other major commodities (Murphy and Hall 2011; World Bank 2015). We developed a model that simulated the costs of sustaining marsh with hydraulic dredging into the future. We used existing eco-geomorphic marsh elevation models calibrated to the physical setting of the Mississippi delta to simulate the cost of marsh creation given different scenarios of sea-level rise and energy costs (see Wiegman 2017). Sea-level rise was simulated using the same functions as in Investigation 1. The modeling objective was to simulate marsh creation in an open bay (initial depth of −50 cm) starting in 2016 and to sustain a productive marsh out to 2100 by periodically nourishing the marsh with dredged sediment (fill elevation of 100 cm) when the marsh fell more than 10 cm below mean sea level (Fig. A3). We built a subroutine in the model to estimate the cost of dredging as a function of crude oil prices. Crude oil price projections were assembled from a suite of energy modeling agencies and published literature (EIA 2015; IEA 2015; McGlade 2014; Heun and De Wit 2012). A list of energy scenarios and assumptions are provided in Table A2. We ran simulations for the energy and sea-level rise scenarios for a marsh with low total suspended sediment (TSS) input and high TSS input (Fig. A3). The low TSS marsh was set to a concentration of 20 mg/L, which on the low end of values reported for marshes in Barataria and Terrebonne bays that are isolated from sediment input from the Mississippi River by flood control levees. The high TSS marsh was set to a concentration of 160 mg/L, which is the rough mean concentration in the Mississippi and Atchafalaya rivers (Allison and Meselhe 2010). We calculated a marsh creation cost index (MCCI). The MCCI is the cost increase above a no change scenario in energy price and sea level rise, at TSS of 20 mg L−1. An MCCI of 1 corresponds to a cost of ~121,600 2010$/ha, an MCCI of 2 would be double this amount, and an MCCI of 0.5 would be half. With TSS at 20 mg L−1 the average MCCI across all sea-level rise and energy scenarios is 3.8. With TSS at 160 mg L−1 the average MCCI is 2.8, a ~25% reduction in costs (Fig. A4). In the high sea-level rise and Energy scenarios the MCCI for both TSS levels exceeds 6, over 750,000 $2010/ha. Pumping distance and substrate type affect costs (see chapter “ The Costs and Sustainability of Ongoing Efforts to Restore and Protect Louisiana’s Coast”), while local subsidence rates affect marsh sustainability. We assumed a nearby borrow source (<5 miles) and a subsidence rate of 0.9 cm/year. MCCI would rise substantially if subsidence or pumping distance were to increase. Figure A5 shows areas where there is potential for river re-introduction and high TSS levels in the Mississippi delta; these areas will be more sustainable than regions with low river potential.